Condominium living is booming in the Philippines, and it’s because more young urban professionals (yuppies) and small families are opting to live where they work and play. Metro Manila traffic, cramped public-utility vehicles, and demanding work schedules play a part in this “modern” housing preference. Thanks to the practicality and convenience they offer, condominiums have become a choice investment for many overseas Filipino workers (OFWs) and Filipinos with highly disposable income. Having a unit or several units rented out is one of the easiest ways of earning more income, not to mention getting a quick return on investment. Condo owners have the option to semi-furnish, fully furnish or rent out a bare unit, but experience tells them that furnishing a unit, at least with basic furniture, is the fastest way have it rented out to students, yuppies, and new families. The Simply Modular Furniture System, which started in Hong Kong, Japan and South Korea, is quickly gaining popularity among millenials, as well as condo investors. It is fun, flexible, practical, durable, and affordable, as it combines function, quality, design and value—all with sustainability in mind. It is the first of its kind in the Philippines. Simply Modular offers connectable panels that are self-assembled to form different types of furniture—a shelf, cabinet, console table, closet, bed, desk, bench, and more. They may be reused and morphed into different styles and sizes as needed. Storing the panels takes up minimal space, as they are flatly stacked in an easily transportable box. All parts, made from high quality ABS plastic, are 100-percent waterproof, termite-proof, rust-proof, and can hold up to 200 kilos. Two usual cons of condo living are a tighter space and construction limitations. One has to comply with building policies, which usually take quite a while to get approved, if even allowed. Most developers are strict with drilling and construction noise. Unlike Ikea furniture, Simply Modular does not require tools. Assembly and storage are done using a click-and-stack mechanism. Simply Modular sells Full Sets, Kids’ Animal Panel, and Add-on Accessories. The basic six SET forms one cube. Other full sets available are the 11 SET, 15+6 SET, 16 SET and 20 SET, with longer 727-millimeter panels and basic 320 mm panels. Both panel sizes have a thickness of 20 mm. One may select a panel color from the available swatches. Sophisticated furniture systems may be assembled by adding accessories, such as door handles, a clothing rail, and shelves. No need to paint or varnish. Simply Modular is not limited to condo use. The Kids Animal Panel is a popular choice for nurseries, daycare centers, children’s locker rooms, and play zones. 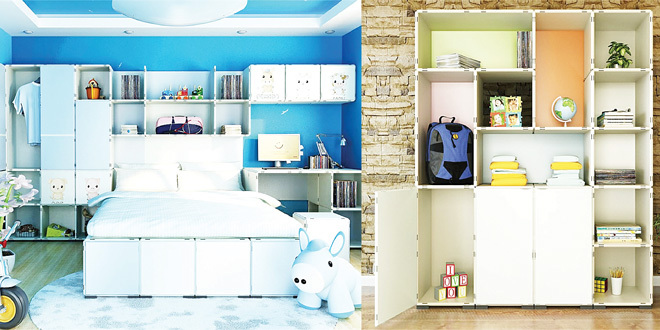 A Simply Modular crib may be transformed into a child’s bed and eventually into a full-sized bed. Most offices have started using Simply Modular desks, cabinets and shelves as employees come and go. Simply Modular is even found in shower areas, because it’s waterproof. The first store opened on the ground floor of SM Development Corp.’s (SMDC) M Place on Panay Avenue, Quezon City (beside the ABS-CBN office) this month. More branches are expected to open later this year. Simply Modular has partnered with SMDC malls below SMDC condos to cater to their customers and other condo dwellers in Metro Manila. They can buy online and avail themselves of hassle-free delivery service through www.simplymodular.ph. For more information, visit www.facebook.com/simplymodular. For instructional videos, visit the Simply Modular PH YouTube channel.